My boys love “tacaroni.” They have for years. 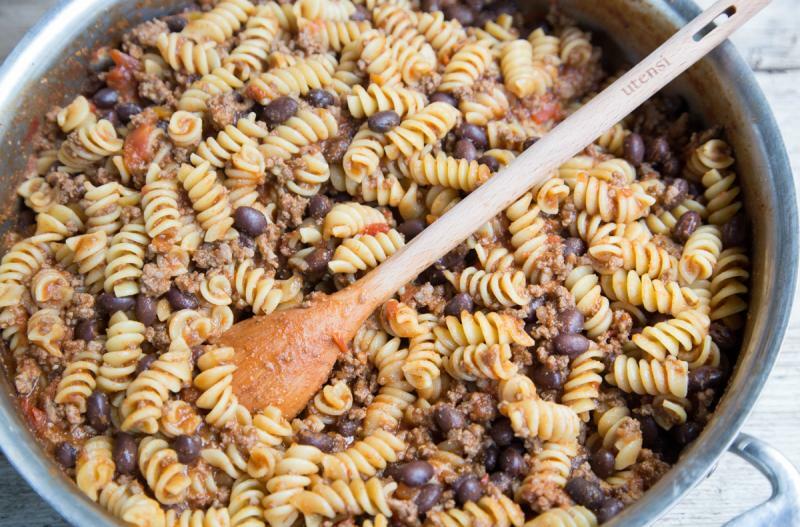 And this is my skillet hack version of the “tacaroni” that they love! This is very much a “homemade hamburger helper” kind of meal. And it’s amazing! If you’ve never cooked a skillet meal from scratch like this, please let me teach you. I survive the busy-madness with these kinds of quick and easy meals. Bring to bubbling again, then cover and let pasta cook for 10 minutes, or al dente. Immediately remove from heat, so the pasta doesn't overcook. 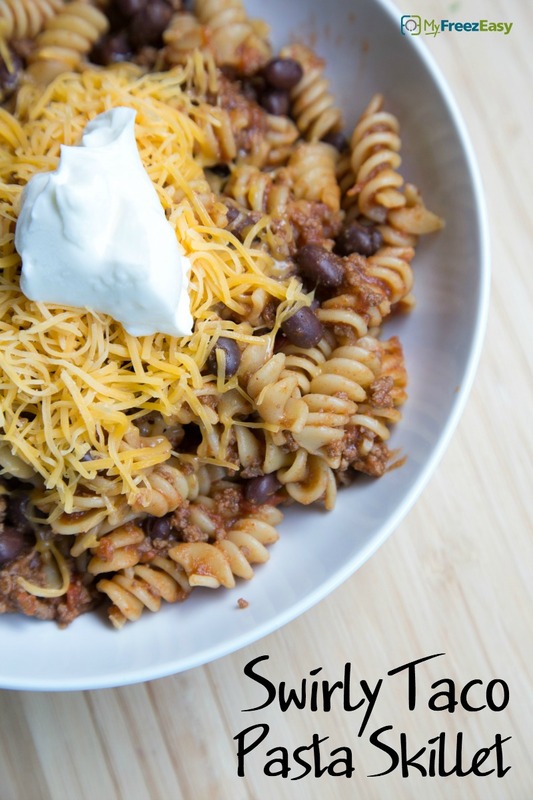 Serve Swirly Taco Pasta Skillet with shredded cheese or sour cream garnish and veggies. Put baggie in the freezer and freeze up to 6 months in fridge freezer or 12 months in a deep freezer. Thaw in the fridge overnight, or a warm bowl of water for about 20 minutes, before transferring to the skillet for reheating. Once warmed through, stir in the pasta noodles with 2 1/2 cups chicken stock, cover with lid and cook pasta for 10 minutes. Recipe is dairy-free when garnishes are omitted. Recipe is gluten-free when you use gluten-free pasta. Thaw and reheat in skillet. Once warmed through, stir in the pasta noodles with 2 1/2 cups chicken stock, cover with lid and cook pasta for 10 minutes. Serve garnished with shredded cheese or sour cream and veggies.